“When this card appears to you, it is time to ask yourself what needs healing in your life. Keep your heart open, and be compassionate towards yourself and others. Allow love to weave a beautiful tapestry within your heart, expanding our senses. Then you will start to see it all around you, in every person and life-form. You will begin to respond and communicate lovingly. You will feel lighter, happier, and free of burdens. Green asks you to open to self-love now and cultivate a relationship with yourself. This colour is associated with the heart chakra, which in turn represents healing, growth, love, and nurturing. Green also represents communicating from the heart. Trust yourself and others. Keep faith that your heart will not lead you astray. Love is a compass. 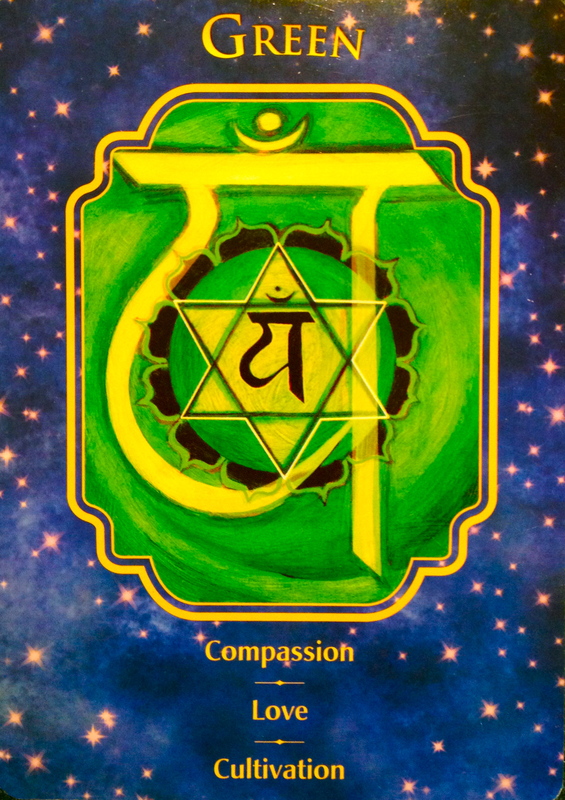 If you are unbalanced in your heart chakra, compassion is what you need to be employing, not empathy or sympatyh, as these drain energy. If you offer others help out of obligation, shame, guilt, or fear, you will burn out. You need to allow yourself to receive. Foster a safe and supportive environment by releasing judgment. See the world with the eyes of your heart. When you do, you will feel vitality returning to you. Today is the new moon, and the perfect time to set the intention for what you would like to bring into your life at this time. Green brings the message to lead with our hearts, asking us to look deeply within and ask our heart (which is actually a direct connection to our Soul) what needs healing right now in order to move forward. The new moon is a powerful time to set intentions, sewing the seeds of short term goals to be reached by the full moon and then releasing old energies with the waning moon. A perfect cycle. If possible, go outside barefoot under the new moon. Tilt your face and raise your palms, rooting your feet firmly to the Earth and state your intention; plant your seeds; either out loud, silently or write them out on paper and read them. Imagine the new moon gently cradling your intentions, protecting them and giving them life as they slowly grow with the light of the moon to full fruition on July 2nd. Send gratitude, knowing that your intentions are safe, that you are fully supported, and that the changes that are coming are for the highest good of all.